Last weekend Emily and I did something a little different. 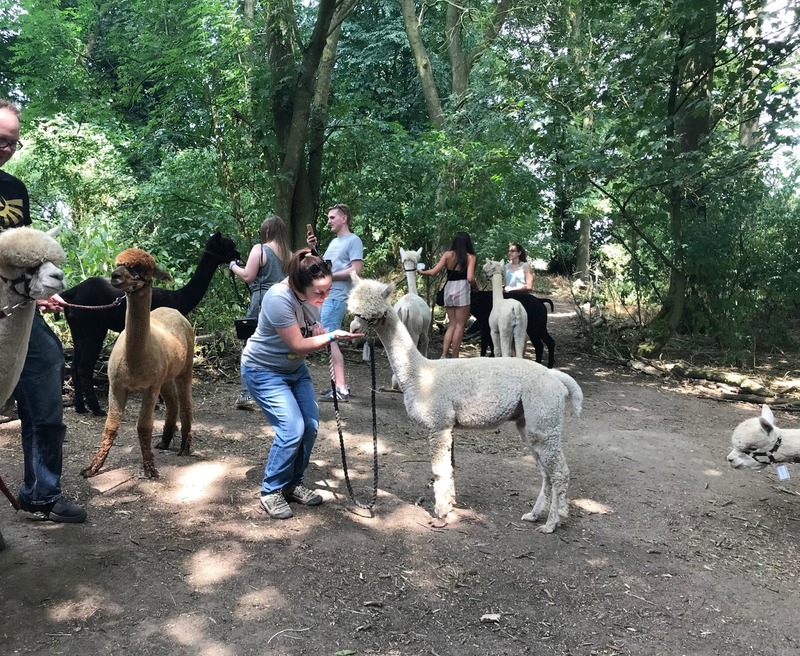 We went trekking with the cutest, friendliest little guys from Charnwood Forest Alpacas. Just chilling with my new furry friends. 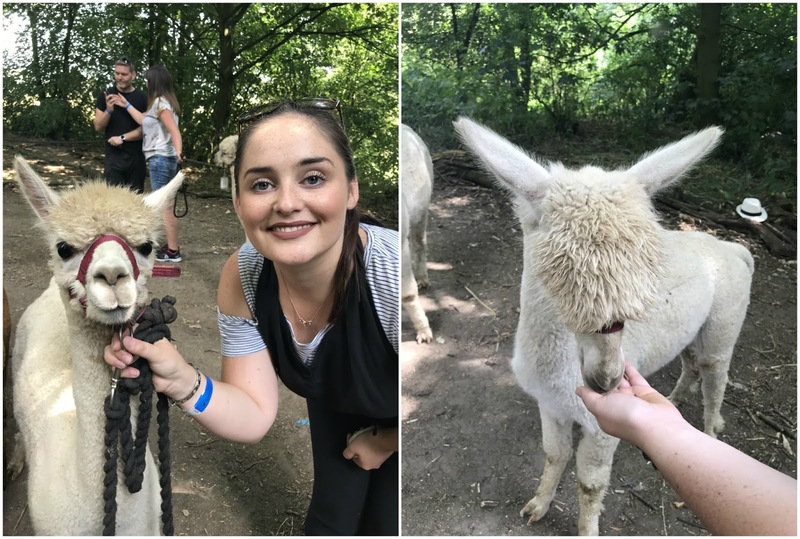 Back in March I saw an offer on Wowcher for Alpaca trekking and I thought it would be a great idea to book it for Tom and Emily's birthdays. I was sure they'd love it, well, I knew it would be right up Emily's street but wasn't 100% sure on Tom. Didn't need to worry though as he went a few weeks back with his girlfriend and they LOVED it! It made us more excited for our visit. Nick came with us but didn't do the trek. As soon as we arrived we picked up some bags of food and headed down to the pens to say hello and get aquatinted! They were so cute and funny, with their own cheeky little personalities, all with their crazy haircut. More interested in the food I must admit! They'd just eat non stop if you let them. You've given a wristband when you arrive and you listen out for your group to be called. We were like over excited little kids as we headed into the barn for a brief talk by our walker Harriet. 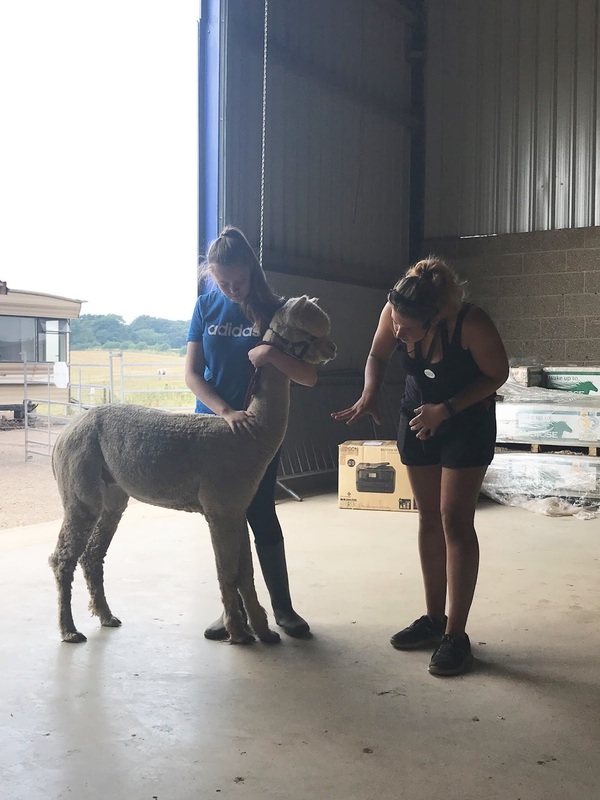 She told us about the origins of the Alpaca, talked about the wool, and then had one come into the barn to talk about feet and teeth (Fun fact: Alpaca only have bottom teeth, just gums on the top). Talk over and we were off to be paired up with our friendly fellows. It was all males walking that day. You can't pick your walking partner, you're just handed the next one out the pen. 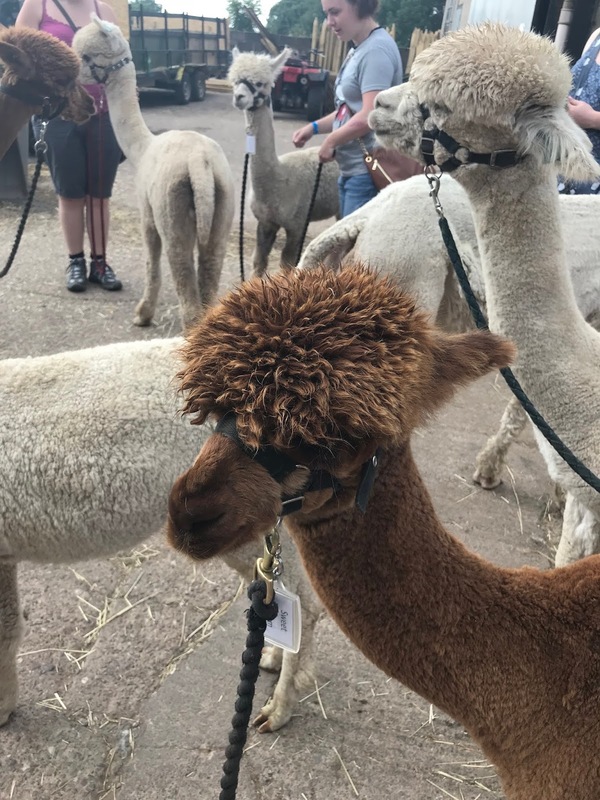 I really wanted a brown one, or black, they're my favourite, not that I don't like the white ones, don't want to offend any alpacas here, and I was lucky, I was handed the lead for a gorgeous brown alpaca with the fluffiest mop top. My little chap was called Sweet William. And then we were off. 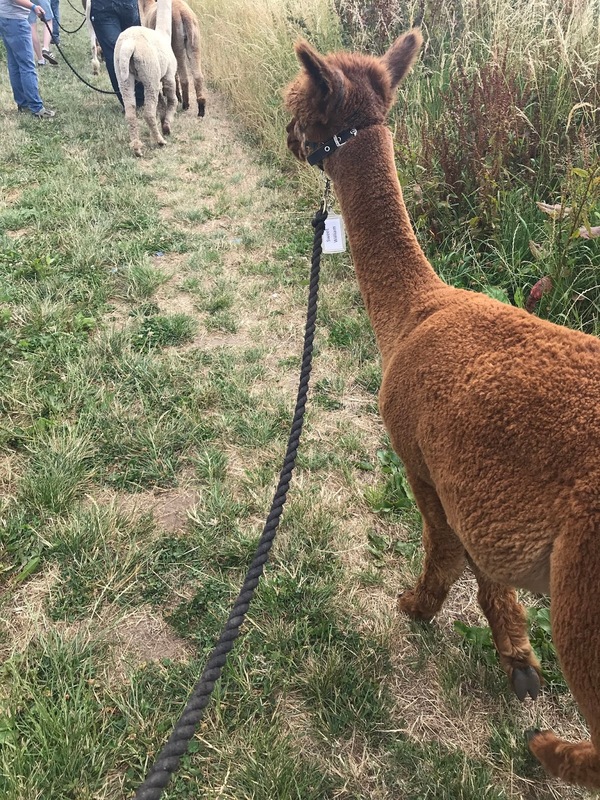 They're so happy to get out for a walk, and they made me laugh looking around at the horses in the fields and at whatever else was going on, they're so inquisitive. They're gentle animals and so happy just to walk alongside you. 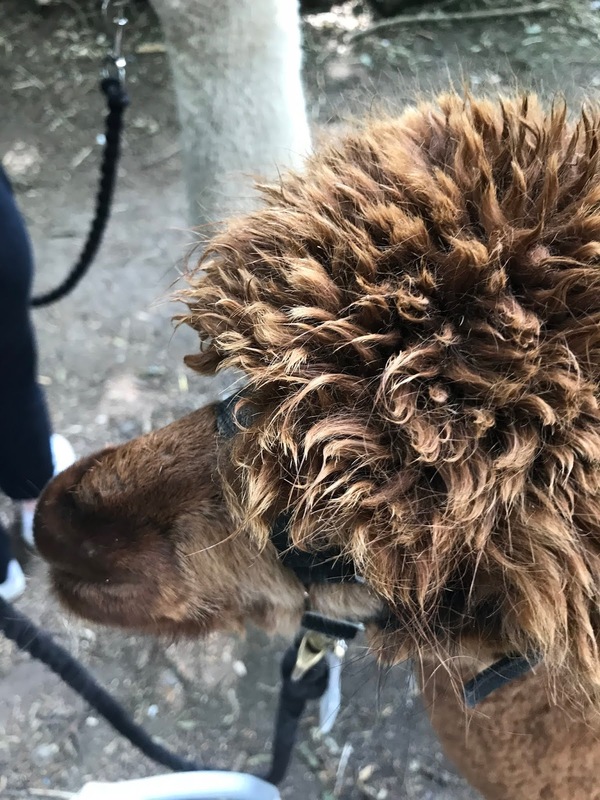 My Sweet William apparently liked to be the leader of the pack and kept trying to get ahead which meant me getting tangled in everyones leads!!! Emily's was a baby at only 9 months and if I remember rightly was called No Man on an Island, I know, weird long name, but quite a few had really long names for some reason. Em shortened it to No Man. 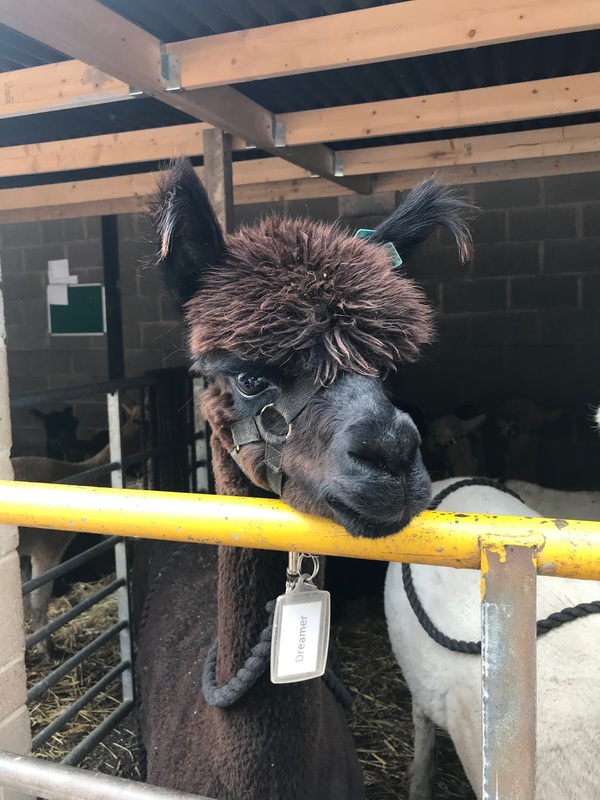 Anyway, No Man, was a little skittish and a bit jumpy with her at first, he's only a baby bless him, and wasn't much for being stroked but they soon got used to each other and became best of friends, especially when he heard the rustle of the food bag! Because he was small he also kept ducking and diving under the others leads and at one point tried to take Emily off roading through the trees. It was funny. It's a little difficult to take photos as you're walking (although I did) but you have plenty of photo opps when you arrive at the clearing in the woods. 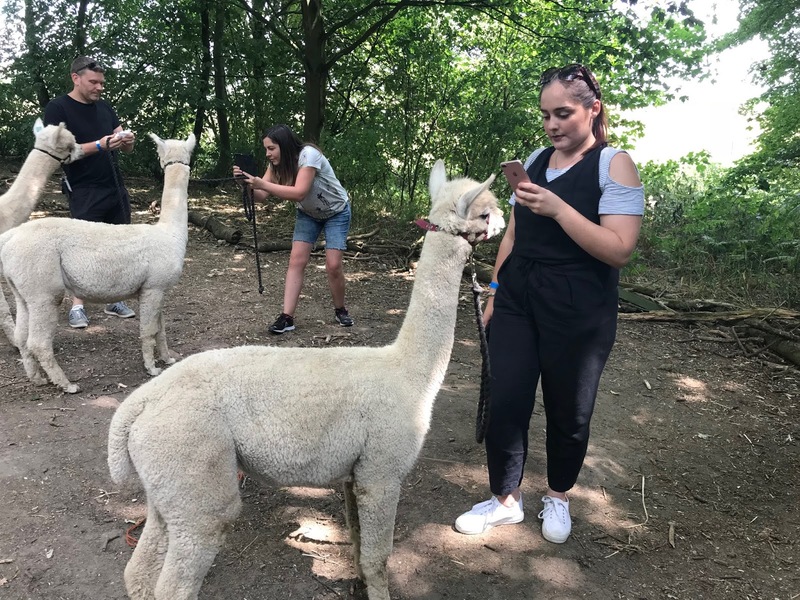 Your walker encourages you to squat down low and get a selfie with your new found friend, and they're more than happy to oblige, they've got this selfie thing nailed! Just look at Sweet Williams golden mop. We did contemplate squeezing one in the back seat of the car next to Emily but they're pack animals and we only had room for one so it wouldn't have been fair. Soon had smiles back on our faces though as we were off for afternoon tea with prosecco. This was included in the deal I had booked. 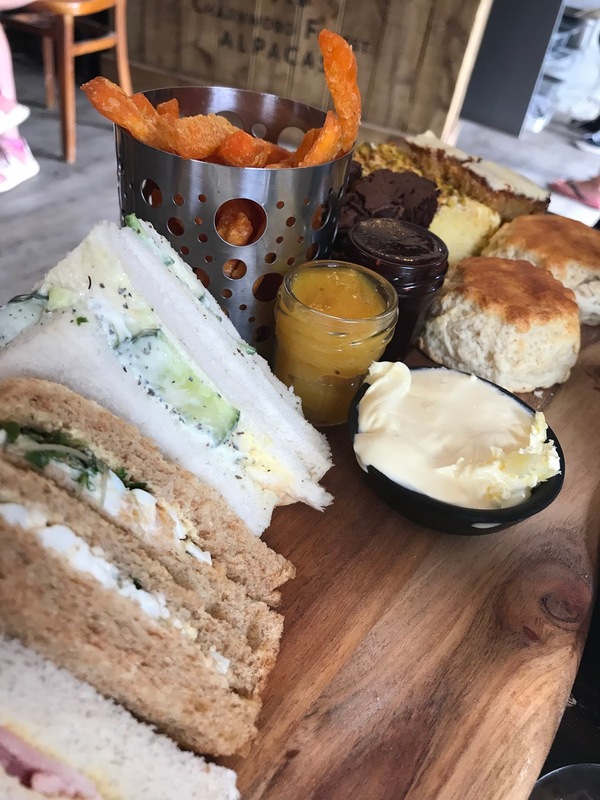 It was nice enough, although the fizz wasn't particularly cold, and the sweet potato fries were an unusual addition to an afternoon tea but very welcome. There's enough for two people, in fact we ended up taking some of the cakes home as we were full after the sandwiches, scones and fries. The scones were delicious and they catered for the fact that we asked for plain scones instead of fruit ones. The Chilli Bean cafe itself is nothing fancy, quite basic but they have a good menu to choose from if you do want to eat there. The facilities there are basic, could do with more toilets, as it was busy when we went, and perhaps some parasols outside. It was a scorcher of a day and so hot inside the cafe. 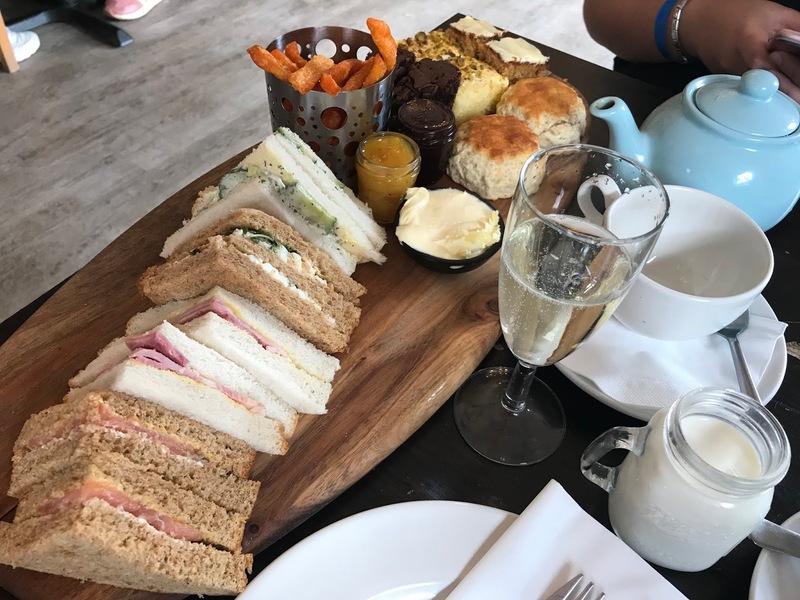 I wanted to sit outside with my afternoon tea as there was a gentle breeze but didn't want to sit in full sun and there was no shade at all. All these things aside I had to remind myself that it's a working farm and that's what it's all about, the animals and the farm, not fancy facilities. Wowcher still have the offer on now. They have the one that we did with the walk and afternoon tea here and there's also one for a 90 minute walk here. 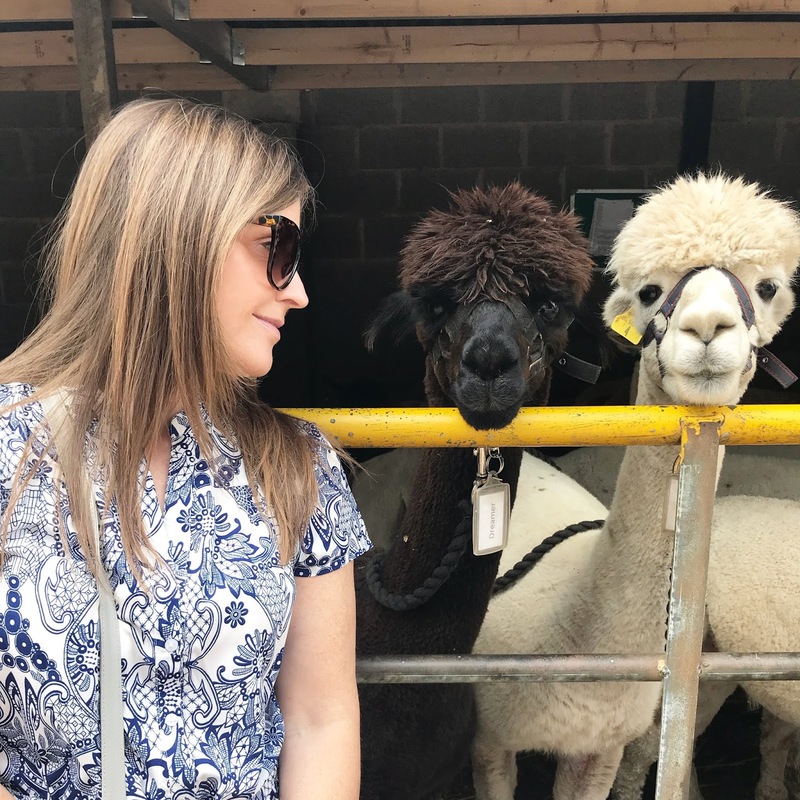 The one with afternoon is a really lovely experience and great to book as a birthday gift and I'm glad I did it, but you do only get around a 30/40 minute walk and to be honest I'd rather spend longer with the Alpacas. That's why I'm booking again for the 90 minute walk. Emily's already booked to go back with her boyfriend! 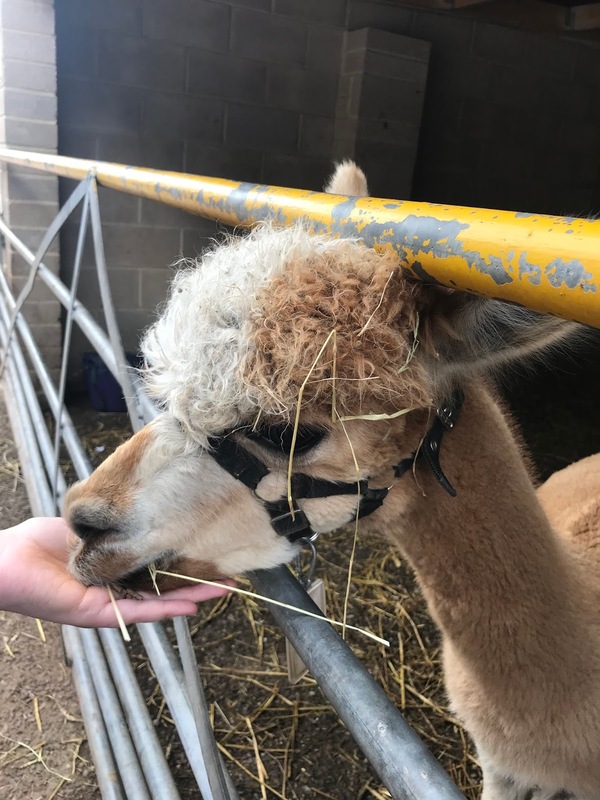 Charnwood Forest Alpacas is on the Leicestershire/Derbyshire border but I know there are so many around the country that do the same thing. If you get the chance I urge you to do it. It's such an uplifting experience and leaves you feeling all happy inside. 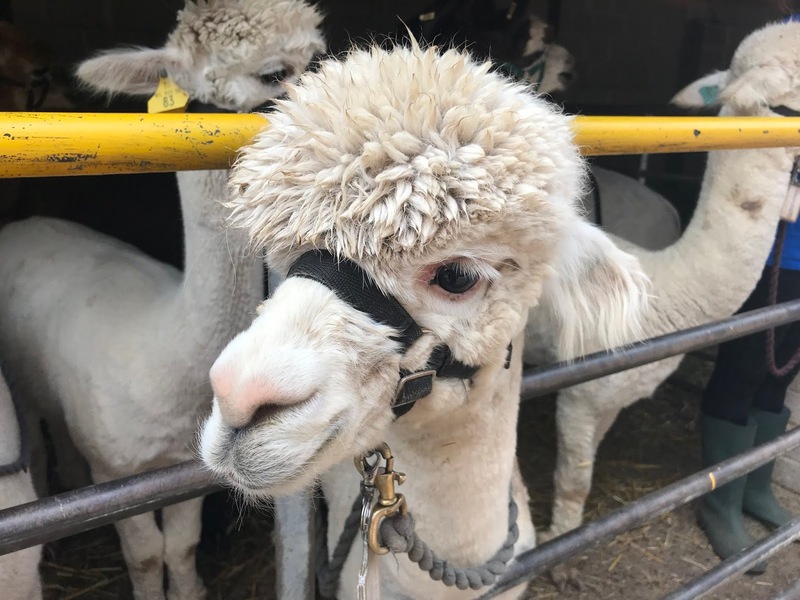 Alpacas are such chilled out animals you'll love it I promise. 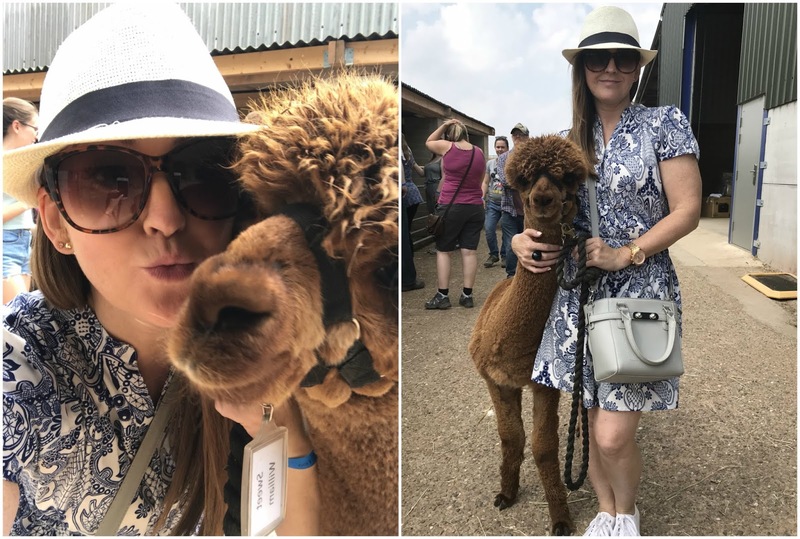 Have you been on an Alpaca trek?